Arcadia offers a wonderful blend of features tailored to relaxation and pampering. Step aboard and you’ll find that you are spoilt for choice. In addition to an expansive spa, with thermal suite and hydro-therapy pool, Arcadia houses an art gallery, a three-tiered theatre and a boutique cinema – you’ll always find something to keep you entertained. Explore the world with Arcadia on one of her exotic-fly cruises, or experience the once in a lifetime full World Cruise. Walk on the best beaches, look out from the tallest buildings, meet the most interesting wildlife and behold the ultimate natural wonders. Or, to get a taste of Arcadia let her take you on a trip a little bit closer to home. 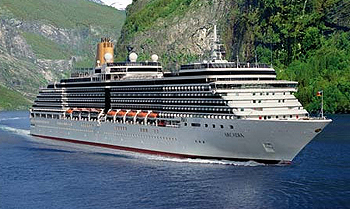 View all Arcadia cruises or view more options for P&O UK cruises. There’s never a dull moment on board Arcadia, when it comes to entertainment and things to do we’ve something for everyone. Arcadia was a mountainous and picturesque district of Greece inhabited by shepherds and beautiful young women. In poetic fantasy Arcadia was a pastoral paradise and the birthplace of Pan, the god of Flocks and Shepherds, who wandered the mountains playing his panpipes. Today it is commonly associated with contentment and rural happiness. With her expansive spa and gymnasium, Arcadia is a haven for well being. All that fresh sea air, combined with the opportunity to relax and unwind is a great tonic for the stresses of everyday life. Step on board and you can let those tensions melt away with a relaxing treatment in the luxurious Oasis Spa. Arcadia’s expansive spa has everything from a couples treatment room to a thermal suite and hydrotherapy pool, making it a heavenly place to spend a few hours. You can also tone up in the ocean-view gymnasium, or even learn how to use her kinesis room, Diversions. Healthy options on the menu help you indulge guilt-free. And daytime activities from Tai Chi to yoga, Reiki and aromatherapy encourage a holistic approach to staying healthy. Foodies will be spoilt for choice in the two-tier main restaurant offering a choice of Club Dining – the same table at the same time each evening – or Freedom Dining with no fixed seating or dining times. The name Arcadia has followed us through several eras from 1954 to the present day. Each ship of this name catered for the needs of the British passenger, and the evolution over time can be seen below. During the time period of 1887 – 1915, the name was christened upon a ship with a Gross Tonnage of 6,603 and a Passenger Capacity of 410. Following the the second world war, the Arcadia was brought back during the years of 1954 – 1979. This ship supported more than three times the passengers of its predecessor. This Arcadia had a Gross Tonnage of 29,664 and a total Passenger Capacity of 1,405. More recently, history has been paid a tribute during the years of 1989 – 2003. During those years the name Arcadia belonged to a magnificent ship of 63,524 Gross Tons and a Passenger Capacity of 1,458. This ship provided a modest increase to the number of passengers but an enormous increase to the available amenities to be experienced while onboard. Now, starting in 2005, the Arcadia will be used in the P&O Fleet on a super liner of 85,000 Gross Tons with enough room to accommodate 1,952 honored guests (a 34 percent increase of the total passenger capacity). Arcadia’s contemporary and innovative experience is not just confined to her stylish rooms and decor. You’ll find that everything from the cuisine to the spa facilities, daytime activities and evening entertainment possess a modern flair. Arcadia’s accommodation comes complete with flat screen televisions. Her rooms are adorned with modern art works by leading British artists. And guest speakers invite you to learn about anything from garden design to wine tasting, color therapy and Reiki. In fact, choices abound on board. So you can be enjoying a wonderfully leisurely time in Arcadia’s luxurious spa one moment, and be tearing around the sports court the next. Or savoring a relaxed poolside snack in the afternoon and being wowed by spectacular cuisine by evening. Watching a grand scale production and aerial acrobatics in the three-tier theatre or being entertained by a lone comedian, center stage. Varied, exciting and eclectic, life on board child-free Arcadia is certain to provide you with some unforgettable experiences.